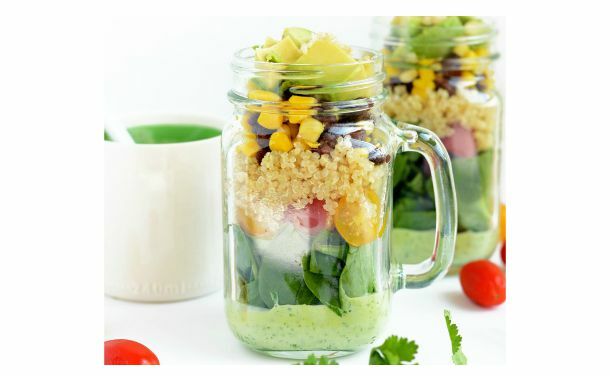 Take your lunch in a jar….be prepared! To make the dressing, place all ingredients for the salad dressing into a small food processor and process until smooth. Add 3 tablespoons of salad dressing to the mason jar base. Then add the following ingredients in this order: 1 cup spinach, 1/4 cup tomatoes, 1/2 cup cooked quinoa, 1/4 cup black beans, 1/4 cup corn and 1/2 avocado (diced).